Last day to apply for a 2019 TJFP grant! Deadline is tonight at 12 midnight EST–please check the eligibility criteria and apply now! Is Your Group Eligible for a TJFP Grant? Are you a grassroots, trans justice group run by and for trans people? Is your group’s total budget less than $250,000? Are you located in the United States or Puerto Rico? Are you centering the leadership of trans people organizing around their experiences with racism, economic injustice, transmisogyny, ableism, immigration, incarceration, and other intersecting oppressions? Are you meeting the needs of different local communities and using organizing and/or providing services to help bring people together? Do you see your work as part of a bigger picture of trans-led work that seeks dignity and justice for all people? *TJFP does not fund individuals. *You do not need to be a 501c3 non-profit or have a fiscal sponsor to apply! Comments Off on Last day to apply for a 2019 TJFP grant! Announcing the 2018 TJFP Grantees! We’re giving away more than ever before to 182 trans-led grassroots groups! 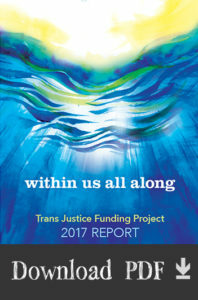 For the past several months, the 2018 TJFP community grantmaking fellows spent hour after hour carefully reading and reviewing applications from 216 trans-led, grassroots groups and projects from around the country and were charged with the task of moving resources to trans communities across the country–this year, a record breaking 182 groups will be receiving a grant. As always, we are inspired by each and every application that was submitted. We felt the overwhelming need our communities are experiencing and we know that oftentimes this work is happening with very little to no support. In May we reached our 50k fundraising goal, allowing us to give away $500,000 this year, but 182 groups is a lot of groups and suddenly $500,000 didn’t feel like that much anymore. Lucky for us and thanks to a few last-minute donors, we were able to increase our total grant money well past half a million dollars—all the way to $650,000! It’s because of our amazing family, friends, and community that we were able to give so much money to so many incredible grassroots trans-justice groups. We are so excited to announce our 2018 Grantees! Comments Off on Announcing the 2018 TJFP Grantees! Half a Million Thanks to You! We’re so happy and proud to announce that we exceeded our fundraising goal and raised $50,922. This means, that once again we’ll be able to distribute $500,000.00 to our grantees this year! That’s half a million dollars supporting something truly invaluable–trans justice led by grassroots, trans leadership across the country. Over 200 individuals donated, which is awe-inspiring and humbling. We can’t thank you enough for all your generosity and support! We truly couldn’t do this without you. Comments Off on Half a Million Thanks to You! Introducing 2018 TJFP Community Grantmaking Fellow, Keiva Lei Cadena! A huge welcome to Keiva Lei Cadena! 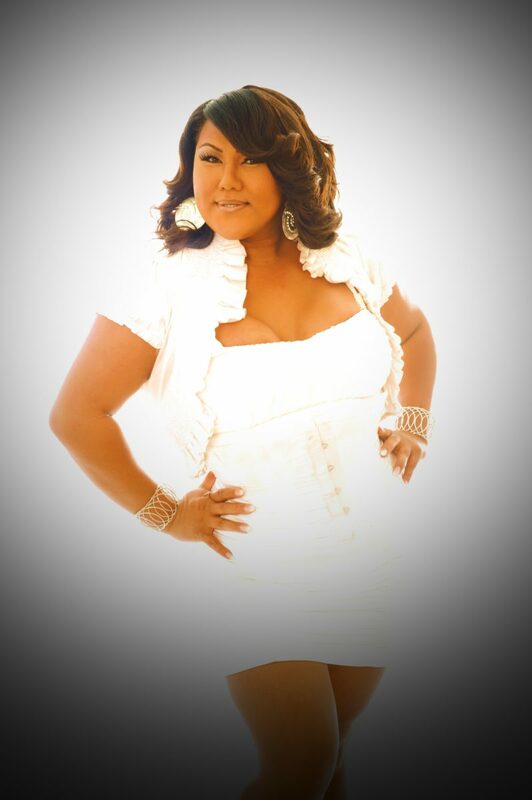 Keiva Lei is a Native Hawaiian Transgender Woman. She was born and raised in the San Francisco Bay Area and has called Honolulu, Hawaii home for the last 20 years. She works as the Community Engagement Coordinator at Life Foundation in Honolulu, where she plans and facilitates programs, retreats, events, and groups, designed to empower, educate, support, and cultivate leadership and advocacy amongst the HIV+ community across the state of Hawaii. She has been living with HIV since August of 2014. Keiva works tirelessly across the country focusing on the decriminalization of HIV, eliminating stigma amongst and against the HIV+ community and rejecting the marginalization of human rights for the Trans community, especially Trans Women of Color. She sits on the Positively Trans National Advisory Board and is a 2017 graduate of NMAC’s Building Leader of Color – BLOC Program. At home, along with her partner Kevin, Keiva cares for her 16 year old daughter Maddisen and her 1 year old granddaughter Makayla. She is strongly connected to her Native Hawaiian heritage and is an award winning Hula dancer since the age of three. We are so excited and grateful for your energy and wisdom! Comments Off on Introducing 2018 TJFP Community Grantmaking Fellow, Keiva Lei Cadena! 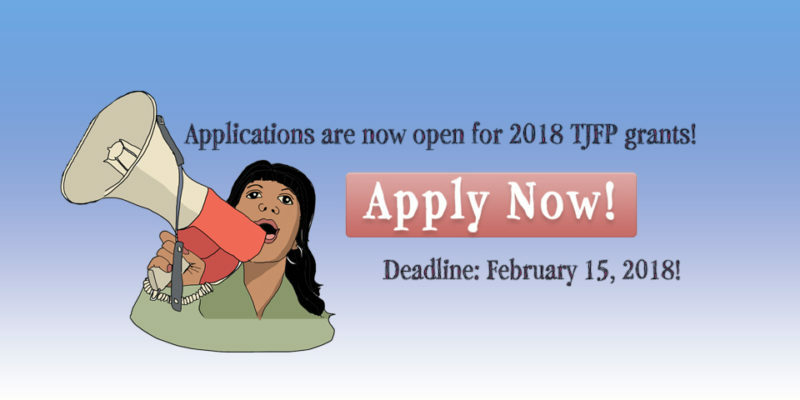 TJFP 2018 Application Deadline Approaching on 2/15! Please spread the word that our application deadline is this Thursday February 15th, 2018 at 12 Midnight EST! Now is the time to apply or encourage others! TJFP does not fund individuals. You do not need to be a 501c3 non-profit or have a fiscal sponsor to apply! 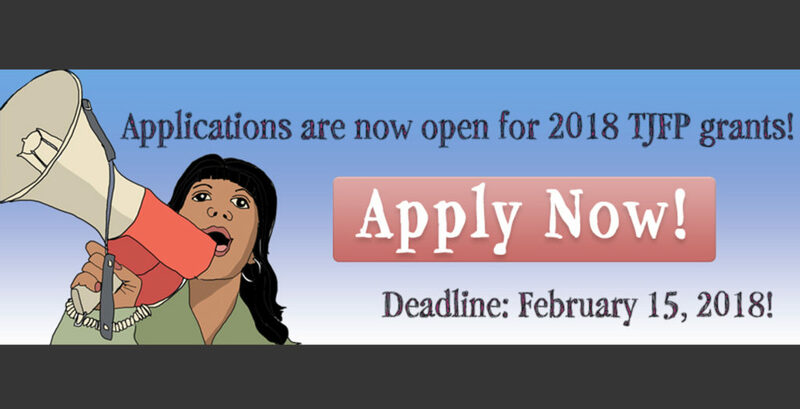 Comments Off on TJFP 2018 Application Deadline Approaching on 2/15! Hot off the press! TJFP’s 2017 annual report is here! We’re so excited to share with you TJFP’s 2017 annual report! Because TJFP has the most incredible family and friends, we had the honor of moving half a million dollars to 153 trans-led grassroots groups across the country last year. We hope you’ll take the opportunity to learn more about these fierce folks by viewing our 2017 annual report! They are history in the making. Also… applications are now open for 2018 TJFP grants! Please review the eligibility criteria and apply! The deadline to apply is 2/15/2018 so spread the word and share widely! Comments Off on Hot off the press! TJFP’s 2017 annual report is here! TJFP to receive the Out for Impact Award! TJFP is so honored to be receiving the Out for Impact Award from Funders for LGBTQ Issues at their 35th anniversary celebration, The Pride in Philanthropy Awards! TJFP is being recognized for our leadership supporting grassroots trans-led groups across the country, empowering transgender leaders in community-based organizations and in philanthropy, and transforming the conversation around impactful grantmaking within trans communities. Thank you Funders for LGBTQ Issues for this momentous award! Comments Off on TJFP to receive the Out for Impact Award! Introducing 2017 TJFP Community Grantmaking Fellow, Mattee Jim! We are so excited to announce our final 2017 TJFP fellow, Mattee Jim! Mattee is of the Zuni People Clan and born for the Towering House People Clan, this is how she identifies herself as a Navajo Person. Mattee currently works as a Supervisor for HIV Prevention Programs for First Nations Community HealthSource in Albuquerque, NM. 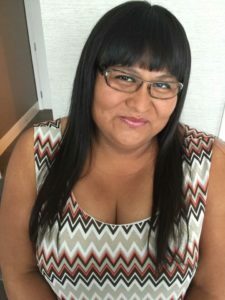 Mattee is also a Board Member for the Transgender Resource Center of New Mexico, and A member of the Southwest Indigenous Women’s Coalition Native LGBTQ. Mattee has been Blessed to have many years of Sobriety and also takes honor in being a Mentor, Advocate, role model, Trainer, Consultant, Leader, and a Strong Native Transgender Woman. We are so looking forward to spending time and learning from your brilliance! Comments Off on Introducing 2017 TJFP Community Grantmaking Fellow, Mattee Jim! Introducing 2017 TJFP Community Grantmaking Fellow, Cathy Kapua! TJFP is so excited to introduce the first of our six Community Grantmaking Fellows, Cathy Kapua! We’re looking forward to building with you Cathy! Comments Off on Introducing 2017 TJFP Community Grantmaking Fellow, Cathy Kapua! 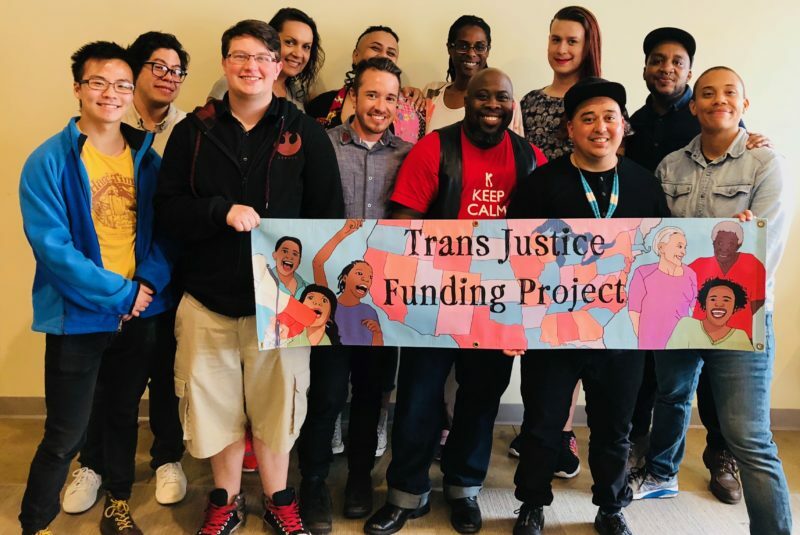 As we prepare for our community-led grantmaking weekend, we’ve been keeping in our hearts the amazing trans justice activists and organizers who are fiercely dedicated to social justice. From the activists protesting the hateful anti-trans bills popping up across the country to the trans-led support groups in small towns keeping each other safe and healthy–we are deeply grateful for the movement.